What Makes A Wine “Authentic”? As is often the case, Steve Heimoff has posted a “think piece” on his blog today. And judging by the relatively few comments at the time I write this most readers are just doing that; thinking. His post is on authenticity in wine and how difficult and subjective it is to define. In the end, Steve gives no answers on the subject but does get one thinking about what makes a wine “authentic”. To me authenticity starts with the intent of the winemaker and what the site and vineyard manager has provided her or him to work with. Can you make authentic Syrah in Napa Valley? Perhaps but other sites might be more suited to growing the grape. 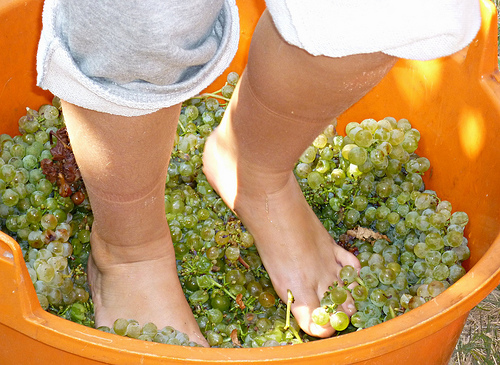 Should anything be added to the crushed grapes to make an “authentic wine”? Some would argue no, but denying scientific advances is similar to not using modern medicine to avoid fatal illness. The issue is loaded with traditional, cultural and political nuances. No discussion of wine authenticity should lack the obvious mention of low intervention or so-called “natural wine“. My own preference in my single quasi-commercial winemaking venture to date used as few processes as was possible in a shared winemaking facility like Crushpad in Dog Patch. Yes, yeast was inoculated as conducting a native yeast ferment, which was my preference, was not recommended within a winery with dozens, if not hundreds, of other fermentations taking place. Yes, enzymes and a minimal dose of sulfur were used on the must but after pressing only regular stirring of the lees was applied and the wine was only racked once after several months in barrel (it is a Roussanne/Marsanne blend). Is this not a “natural, authentic” wine? Some would argue one or all of the three additives used makes this wine somehow makes it un-natural and less authentic. A few others might argue that trucking the grapes several hundred miles in a refrigerated container is also unauthentic but that’s another story. My point is what is authentic wine is highly debatable. What is not is a sea of industrial wines sold that not only use modern science to produce clean wines but also techniques that make the resulting product softer and more approachable (think micro-oxygenation, mega-purple and other such processes or additives here). That doesn’t mean the wine is not better for all the manipulation but what is left is not an authentic representation of the site and grapes harvested that year. But that’s just my opinion, and as Dennis Miller used to say, I could be wrong.